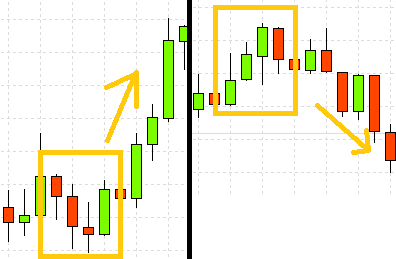 The candle formations are not the only thing we should pay attention to though. We should also look at the size and shape of the individual candles. There are many candle types and their combinations. Sometimes the candle has a long knot, sometimes on the contrary it doesn’t have any. This is exactly what we’ll be talking about today. Let’s start with the candle pinbar. It’s true that it’s not really a candle formation, because it’s made out of only one candle, but that doesn’t matter. A pinbar (or a pin bar) is a candle with a very long knot and a smaller body on the other side of this knot. So, there is either a long high knot, and a bearish candle or vice versa. This candle means that during the process the price has greatly increased, but even though at the end of the candle something happened that influenced the direction of the price development (i.e. : reaching an important line of resistance or support), so the price changed its mind and went the opposite direction. Now, we can predict that the price will indeed continue to move in this same direction. This formation always includes 4 candles in a row. Three of them must be in the same direction and the fourth has to go the opposite way. Formation three line strike indicates the forthcoming trend reversal and works best in the time frame M15 and higher. 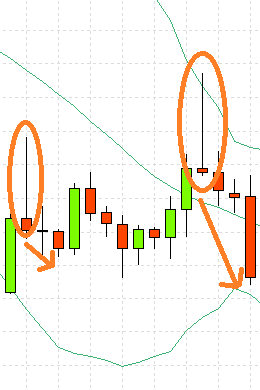 This formation works best with the last candle being a pinbar type. I think that two candle formations are enough for today. Would like to know more about candle formations? Share the article on social media and write in the comments below!